Are you a fan of Surface Pro products but not so much of a fan of their price tags? Well, you’re not alone. Luckily, for the people that aren’t willing to shell out $1,300 USD for a mid-tier product, there is a very good option. I have always liked the Surface series, I think they are one of the most versatile computers you can get on the market right now. 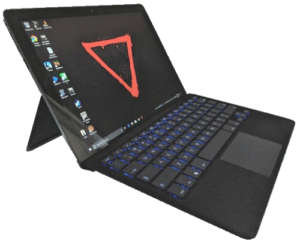 Their 2-in-1 form factor is super cool, but there have always been a couple things that kind of bugged me with the Surface Pro. First, is its price point. Even at its base model, it’s not super wallet friendly. 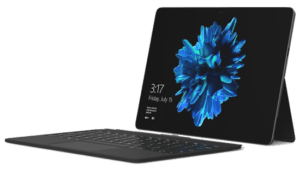 The second thing is that over the years, and we are on the fifth generation of Surface Pro products right now, and they have not improved that much. Of course, there have been incremental improvements every year, but it’s still the same kind of product that it has been since day one. 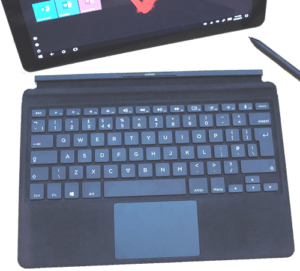 There’s nothing wrong with that, but it’s a pretty conservative approach to the whole 2-in-1 tablet idea. Introducing the Eve V. Upon first impressions this is what I know about this unique 2-in-1 tablet. 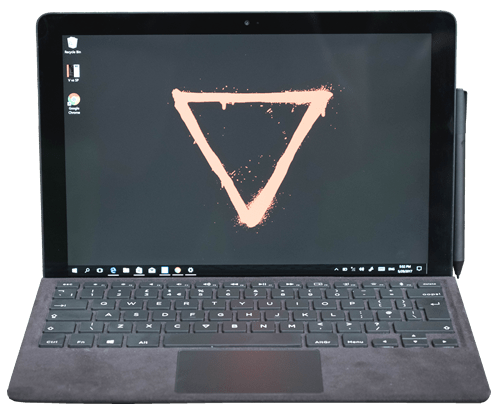 First, the device is very similar to the Microsoft Surface. 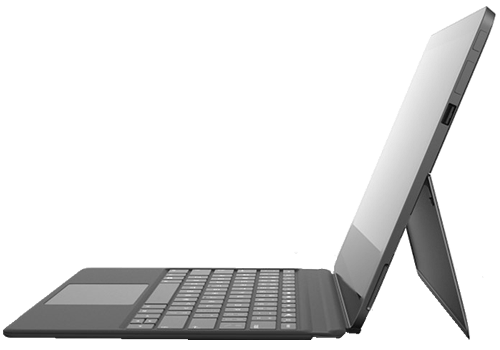 It has a kickstand and the keyboard looks and feels like a Surface. 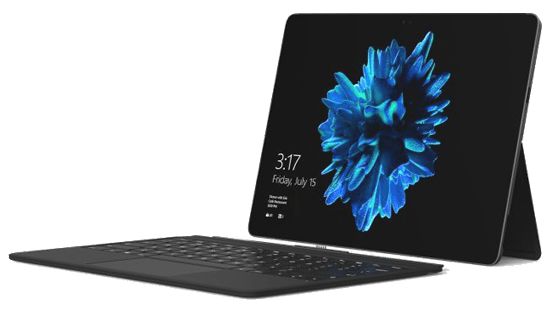 I think many people could mistake this device for some kind of special edition Surface Pro. It’s built of aluminum, it’s not magnesium like the Surface lineup. It’s very solid feeling and very well-crafted. One of, if not the coolest thing about this product, is that this device was completely crowdsourced. This means that they asked a ton of people, some reports say up to 6000, what they would want in a laptop, and then this Eve V was born. One-thousand minds ended up creating this magic. One of the things that people really wanted was good ports. As we know, the Surface lineup doesn’t have a great port selection. You will find two USB-As, two USB-Cs, and one of them is Thunderbolt 3 supported, there is an audio jack that has a quality amp in there, and the power switch also has a fingerprint reader for logging into Windows Hello. There are four speakers that sound pretty decent. They sound better than I thought they would. The display panel looks really nice. It is high-resolution that has been individually calibrated at the factory, so it’s color accurate straight out of the box. It also comes with a stylus for pen input. It’s also compatible with Microsoft’s Surface Pens. It has a few configurations. They are all running Y processors, but these guys have done an amazing job cooling it passively, so it’s fanless. The model I used was running a Core m3 and the temperatures stay low even when the boost kicks in, I could actually play Overwatch at the lowest possible settings and getting about 35-40 frames per second. It wasn’t amazing, but it was capable if you need to get a gaming fix quenched. Remember it has a Thunderbolt 3 port so you can connect an external GPU if you wanted to go nuts. The keyboard is also really nice. This is actually the first 2-in-1 keyboard that I’ve used that has RGB backlighting, and you can switch between a few colors. Typing was super comfortable. The trackpad is good, it’s a glass surface with Windows Precision drivers. Overall, the inputs on this device are really good. The best thing about it is that you can remove the RGB backlit keyboard suddenly becomes a wireless keyboard. It has Bluetooth 4.2 in it and a small battery so you can control it remotely. If you have it connected to a projector for a presentation or something you have that option. The battery in the main device is 48 watt-hours. 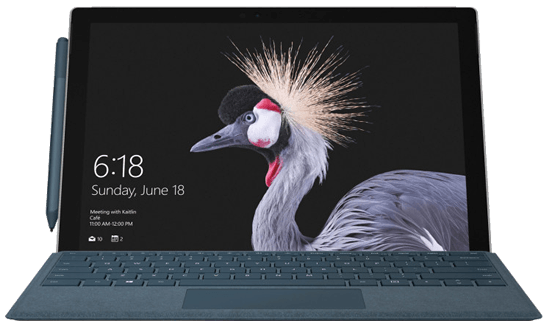 It’s bigger than the Surface Pro 4 from 2016, it’s similar in size to the new Surface Pro from 2017. The Eve V is heavier by about 100 grams or so, most of that extra weight comes from the bigger heatsink. The extra weight is noticeable, but even if you hold it one-handed it is still an extremely comfortable tablet to hold. The camera on this device is not as good as the Surface Pro. So, if image quality on your tablet is important to you, then this probably won’t work for you. Another thing is the stylus has fewer pressure levels. However, for me, these are not things I care too much about in a tablet. There are all these features about the Eve V that are pretty cool. The fingerprint sensor, the RGB keyboard, and Thunderbolt 3 support. Now, the average guy that walks into the Microsoft store looking for a 2-in-1 tablet don’t really care about these features, so Microsoft isn’t going to put these types of features into their tablets anytime soon. On the flip side, these are the types of features that many people, myself included, like. The enthusiast level guys like this stuff, and that’s what makes this product special. The pricing of this device is very fair. 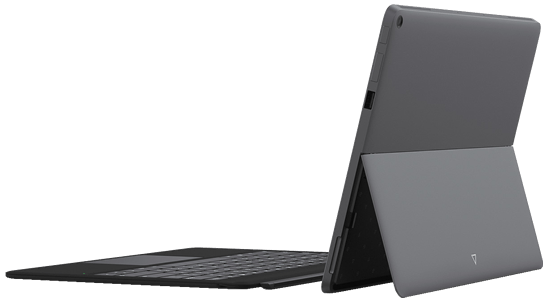 It starts at $800 USD, which is the same base price of the Microsoft Surface Pro, but the Eve product includes a keyboard and you’re getting 8GB of RAM instead of 4GB. I think you’re getting a solid device for your money. The Surface Pro is certainly a very capable and loved device on today’s’ market, but if you’re looking for something a little bit different and more for the enthusiast, then I think you need to take a look at the Eve V.